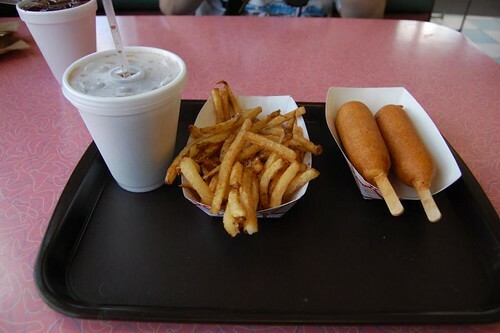 After getting a somewhat late start out of Indy this morning, we made it to Springfield, IL in a record 3 hours for lunch at the Cozy Drive In. Afterward, we picked up Route 66 and headed south through Farmersville, Litchfield, and Mount Olive before arriving in Collinsville. I was on a mission. It’s been more than 6 weeks since we ordered our Serro Scotty trailer, and I needed a fix…bad. The first time I saw one in person was at an RV dealer there back in November. We arrived at Randy’s Trailer Town to a scorching 92 degrees, but that didn’t stop me. I was pleased to find not one, but TWO HiLanders there to gush over. 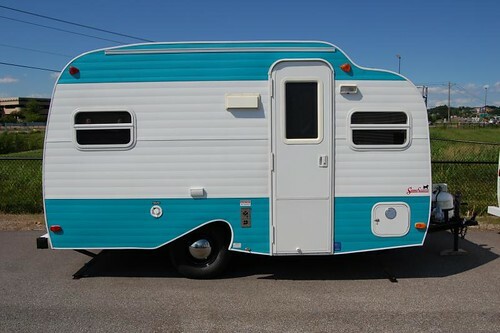 One was unlocked, so we went in just so I could open every cabinet again, check my head clearance in the wet bath, and just sit at the dinette for a minute and imagine what it’ll be like in a couple of weeks sitting in our own HiLander at a campground somewhere in Indiana. After getting the satisfaction I needed, we jumped on I-70 and made our way through rush hour traffic in St. Louis. We then picked up 66 again in Eureka and continued on it the rest of the evening. 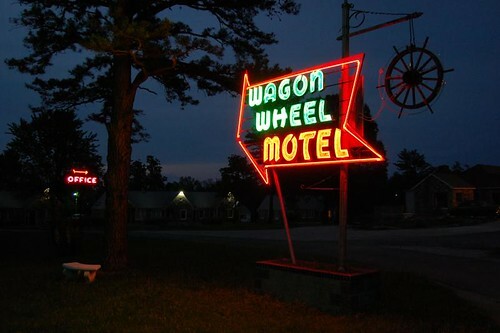 We pulled in to the Wagon Wheel Motel in Cuba, Missouri for our overnight stop. The Wagon Wheel is in the process of a total refurbishing, thanks to new owner Connie Echols. 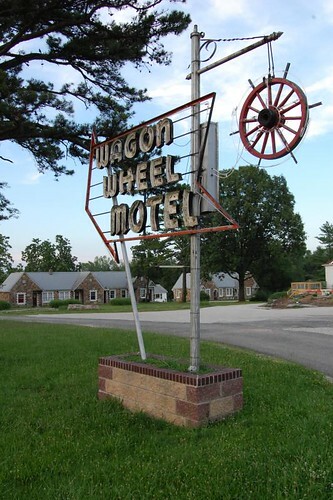 The Wagon Wheel is a classic Route 66 motel, dating back to 1936. Highly worth the stop! 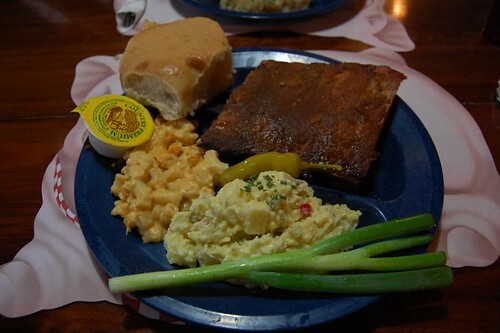 After checking in, we walked next door to a place I’ve been wanting to try for a long time: Missouri Hick BBQ. It’s been here only 8 years, but after one bite, I found their ribs to be legendary! After devouring our tasty BBQ, we walked back over to the Wagon Wheel and admired their classic neon sign. At that point, our day was done. Then it was back in to use their free wi-fi and post the day’s activities. For a complete view of today’s fun, click here. Stay tuned for Day 2 on Thursday! This entry was posted by Pat on June 16, 2010 at 11:25 pm, and is filed under Road Trips. Follow any responses to this post through RSS 2.0.You can leave a response or trackback from your own site. I am envious of your trip. Will be following along as your fun continues! I, too, am envious. I did the Route 66 trip about 15 years ago and found that meeting and talking with the people that had businesses along the Mother Road was icing on the cake. All the old timers I ran into had wonderful stories to tell and memories to share. Enjoy and take time to smell the roses.